It really is quite incredible that a home designed in 1988 could still be as fresh and inspiring today as it was when it was first designed. This version of the Bushland Retreat is really just an update – we played with some minor design elements. Like the saying goes: if it’s not broken, don’t fix it. 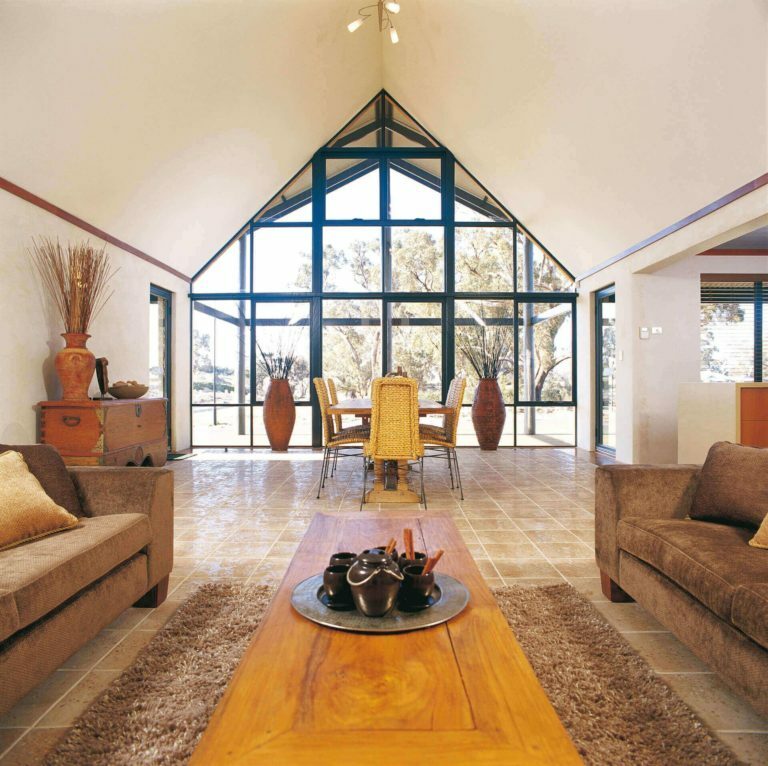 The soaring bush poles, the glazed portals that form a glass wall to the front, the large open spaces and high ceilings – some of the items most loved by those fortunate enough to own a Bushland Retreat – are all still evident. 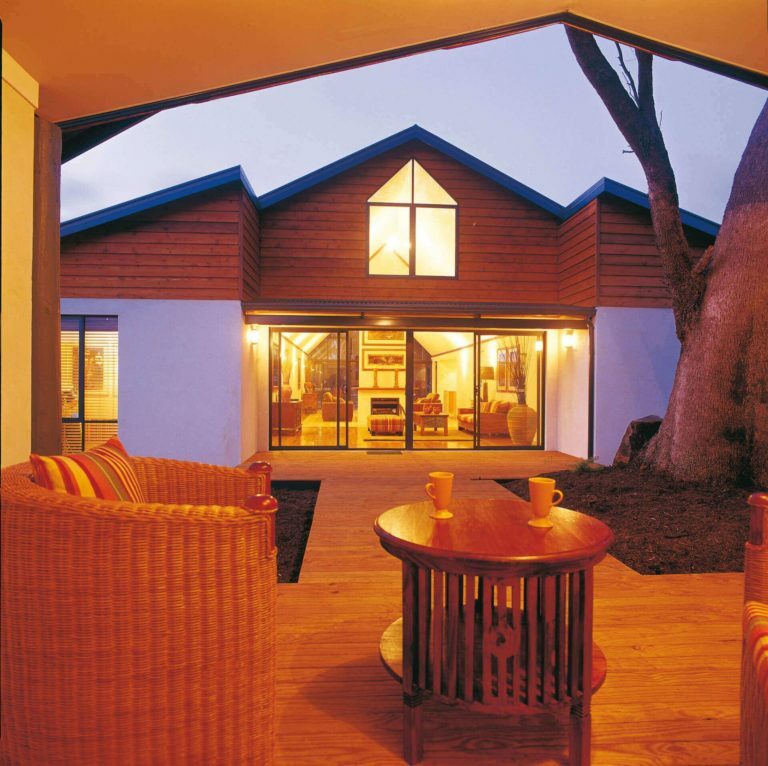 Over the course of the last five years, we’ve been watching what changes people make to their homes and incorporated those changes into the Bushland Retreat 2005. The areas that had virtually no changes were the elevations, with the exception of the attachment of a carport. This we have done so that access can be gained directly into the house through the laundry. It also provides cover when taking the washing out. The home itself was originally designed to provide a large open living space, without the need for the usual Glulam beam or supports within that space. We actually use a reverse truss, which is evident from the section view in the brochure. 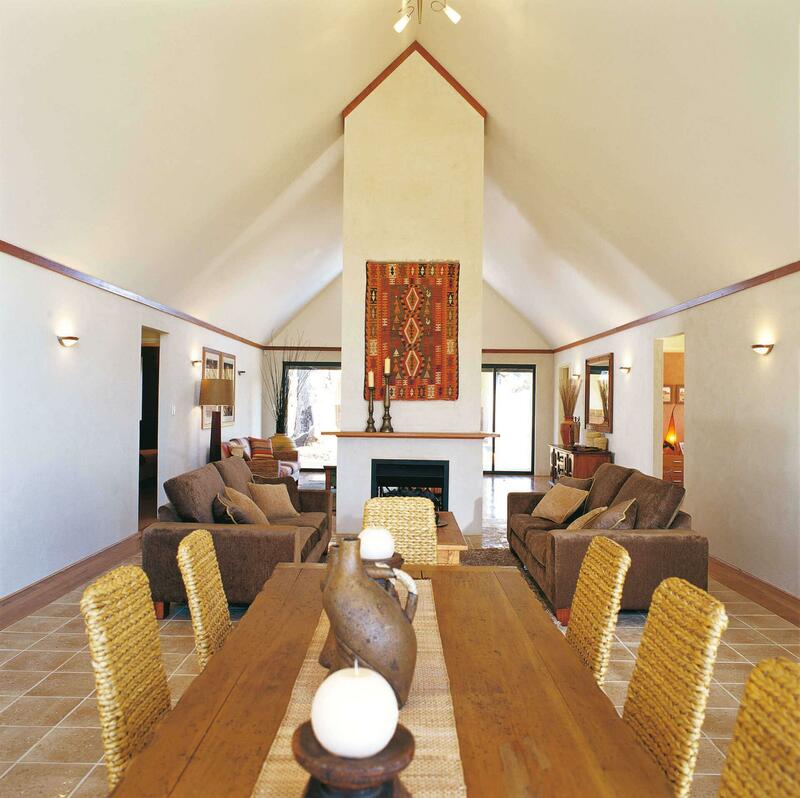 This allows for a 45-degree pitch in the ceiling throughout that living space. There are three core living spaces: the master and office side, which also includes the kitchen; the minor bedrooms and studio to the rear; and the freeform central core area between both – the main living space – which measures 5570 x 15280. The freeform living area is divided by a Jet Master double-sided gas fire. Views can be captured at either end of the building, with the strongest outlook being at the front. There is cover protection in the form of verandahs on every access point and a covered area for a possible deck at the front of the home. These also provide some sun protection. The kitchen was the area where most changes took place. Here we have arranged the space so there is an island bench, which provides an outlook to the front and, at the same time, provides a snack bar/ breakfast bar and a pleasant place for guests to sit around while a gourmet meal is being cooked. The appointments are what you would expect from The Rural Building Company: Westinghouse programmable oven with a separate grill and a hot plate with a wok burner and fish / grilling centre plate; a down draft exhaust fan that rises out of the bench; an appliance cupboard with work bench running through it and into the pantry; and Corian bench tops with large underslung Clark Epure sinks and an Adelphi Tungsten mixer tap. 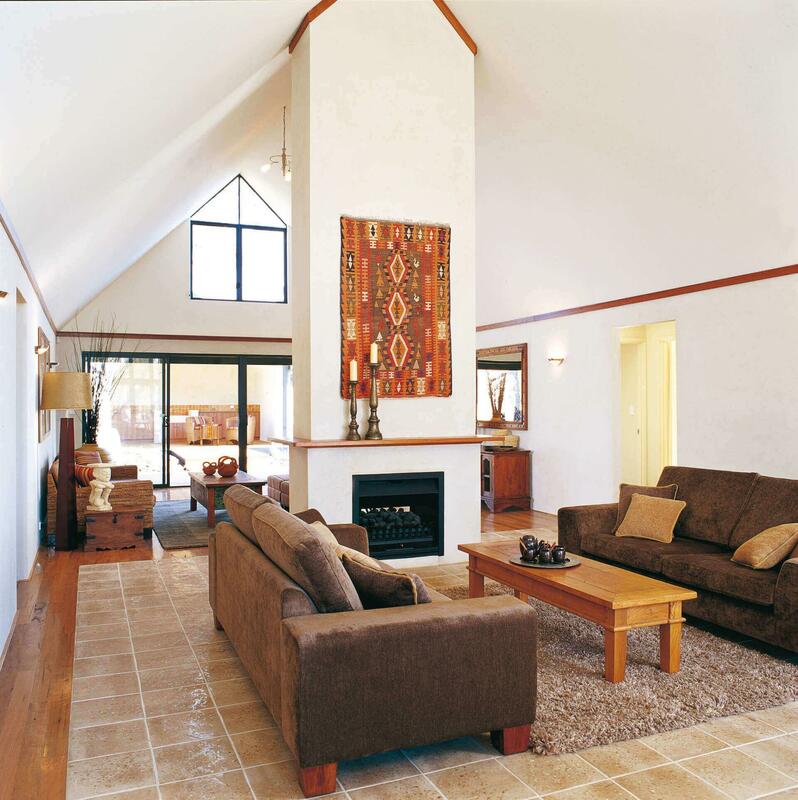 The design of the kitchen, like all Rural Building Company kitchens, was influenced by a leading Australian chef. We have used a metal ceiling to the kitchen and, as always, there is an abundance of drawers, making storage very easy. Another area that was influenced by our customers was a major re-design of the ensuite and dressing room. There is now more room, dual porcelain Tasman Deluxe hand basins, a separate toilet with an easy to clean porcelain pan and cistern. The large shower has clear laminated pivot shower screens. The bathroom on the other side is very similar, with its large Caroma Medina bath and large vanity with a Stylus Minuet basin. The laundry not only has a linen cupboard, it has a separate broom cupboard and a vitreous china inset sink. The toilet has been placed to allow easy access from outside, which works well if you’ve got a bush block. Of course, it goes without saying that we have considered the orientation of the house, even though it is a display. We have provided sun control to the front, which faces true north, by increasing the overhangs. This allows the winter sun in and keeps the summer sun out. We have also provided high windows in the glass portal to ensure air movement in summer, allowing hot air to be moved quickly through cross ventilation, and have minimised the number of windows on the western side. There are the e-vents to take out the hot air from the roof space, insulation, AAA-rated plumbing and a Solar Edwards stainless steel hot water system all assist in making this home energy efficient.